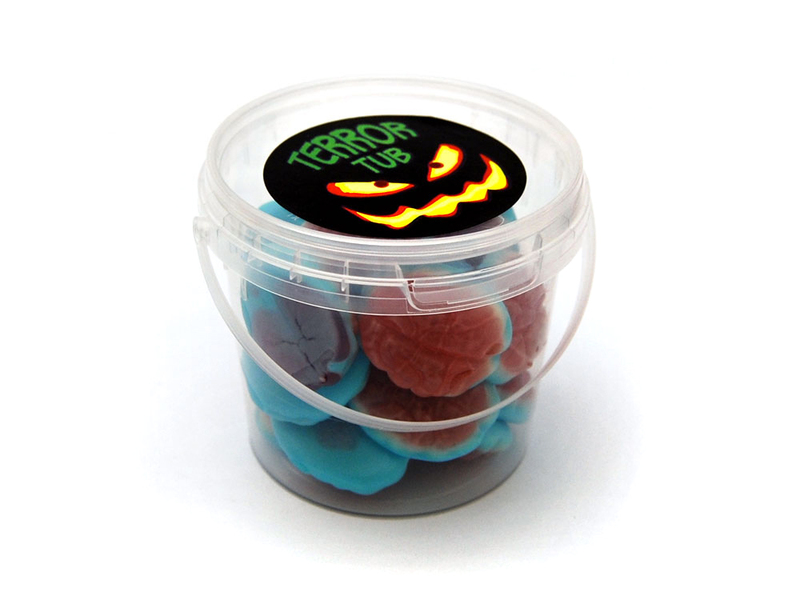 This 190ml plastic bucket of spooky jellies will make a brilliant gift for Halloween. Jelly Brains Ingredients: Glucose Syrup, Sugar, Gelatine, Pectin, Humectant: Sorbitol, Modified Potato Starch, Citric Acid, Glazing Agents: Coconut and palm kernal Oil, Carnauba Wax, Beeswax, Acidity Regulator: sodium Citrate, Colours: E120, E133, Consontrate vegetable: carrot, blackcurrant, radish. Allergen Advice: Highlighted Bold in Ingredients list. Jelly Snails Ingredients: Glucose syrup, sugar, Gelatine; humectant, sorbitols, Acids: Lactic Acid, Citric acid, invert sugar syrup, modified potato starch, Gelling agent: pectins; flavourings; Fruit and Vegetable concentrates: lemon, safflower, carrot, blackcurrant, radish; acidity regulator: sodium citrate; Vegetable oils (coconut oils, palm kernal); Glazing agent: Beeswax, Carnauba Wax, Colours: E100, E120, E133. Allergen Advice: Highlighted Bold in Ingredients list. Jelly Worms Ingredients: Glucose syrup, sugar, beef and pork geletine, modified potato starch, citric acid, Natural flavourings, vegetable oils (coconut oil, palm kernal oil), glazing agents (carnuba wax, beeswax) fruit and vegetable concentrates (paprika, safflower, lemon, radish, blackcurrant, carrot) colours: (cochineal, copper chlorophyllin complex). Allergen Advice: Highlighted Bold in Ingredients list.